William “Billy Ray” Lansing (Seagal) is an ex-military, ex-government agent who now spends his time wandering around the woods of Alaska aimlessly and being a penpal to a 13 year old Polish girl. Seems like a natural career transition. When Billy Ray senses something amiss, he heads to Poland to see if Irina (Nowakoska), his penpal, is alright. While there he teams up with local law enforcement agent Kasia (Wagner)...and discovers a nefarious human trafficking operation led by the super-evil Faisal (Schulze). Luckily, he taught Irina how to create and read secret codes (which is perhaps why she signed on to this penpal program in the first place, why else would she?) - so they continue to communicate via code even though they are separated and he’s hot on her trail. Will Billy Ray find her and take down the baddies in the process? 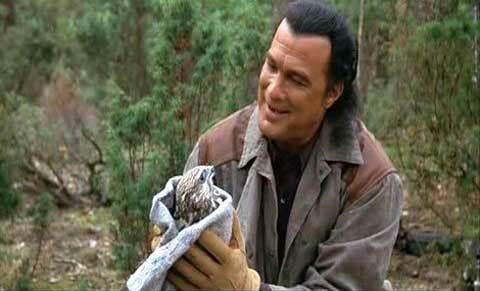 Seagal’s hair in this particular outing is just silly. It’s a black, strange-looking mullet of some kind. Perhaps he caught it in the wilds of Alaska where he now lives. By “him” we mean Billy Ray, of course. This movie might even make an ideal double feature with Radical Jack (2000), because that features one Billy Ray Cyrus. And it’s not just his odd hair and choice of winter coats that’s funny. A lot of his dialogue is overdubbed by someone who is clearly not Seagal. The guy they chose to do this voice-over work has a much higher-pitched voice, not to mention the fact that he speaks clearly and doesn’t slur his words. So that’s funny, and there are many scenes that are clearly not Seagal in front of the camera as well, most notably his “walking around in the woods” scenes. Did they think the audience wouldn’t notice it’s some other guy? But while the movie gets off to a very strange start, it eventually falls into a cross between Taken (2009) and the TV show To Catch A Predator, with a little Seagal on top for good measure. (Also, Seagal is some sort of master of disguise in this movie and goes by a bunch of different fake names, one of which is “Nikolai Rachenko”. This is also Dolph Lundgren’s name in Red Scorpion, 1988. Could this be just a coincidence? But if not, the writers really shouldn’t remind the audience of a far superior action star). Schulze makes for a good baddie, and you know he’s evil because A. He has evil blonde highlights, B. He plays chess and enjoys fencing and C. He seems to live in an M.C. Escher painting. But don’t forget that there’s an illegal Polish internet. And to never eat sushi without decoding the secret message invariably buried within the California rolls. But this is another slyly insulting title for a Seagal movie, along the lines of Belly Of The Beast (2003) and Shadow Man (2006). Who’s titling these things? And are they getting a good chuckle? And is Seagal getting wise to it? Isn’t it a bit too easy -- “Out Of Reach” -- for a sandwich? For a donut? Make up your own fat joke. And the fact that some of the movie was set in Turkey can’t be an accident. The filmmakers probably asked Seagal where he wanted to shoot the movie and he just blurted out “Turkey”. But odds are he was just going to blurt that out anyway and wasn’t paying attention to what they were saying to him. But to be fair, there is some cool camerawork and good shots in this movie. But Out Of Reach needed more Martial Arts. 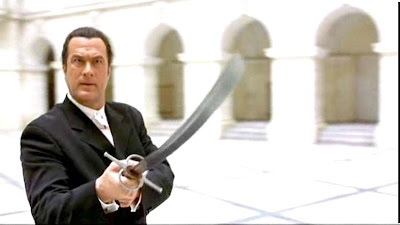 Fencing battles and gunplay is all well and good, but we want to see Seagal do more of his classic slap-fighting. Isn’t that why we’re all really on board? 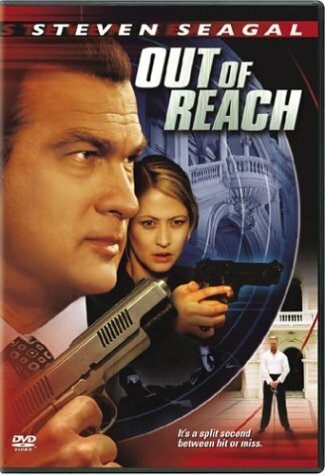 In all, Out Of Reach is a pretty entertaining entry in the 2000’s DTV canon of Seagal. There’s enough out-and-out silliness to keep you engaged, and that’s more than you can say for a lot of his other work. Also check out write-ups from our buddies, DTVC and The Video Vacuum! Yeah, this is a terrible film on many levels. The plot - as you describe - is beyond bizarre. Seagal's vocal dubbing and obvious use of doubles in so much footage make it look like no-one really cared about this film. But for all this it does have a batty charm. I recently rewatched it and enjoyed it much more than I did first time round. Thanks! The dubbing is ridiculous...but it makes the movie more fun to watch. I found this to be one of Seagal's lesser efforts, it was a little too slow moving for my tastes, I personally enjoyed Maximum Conviction more. Yeah, the dubbing is so weird. I can do a better a Steve Seagal impression than the guy doing the overdubs here. Any you know what - I'd do it for free. Venom: Maximum Conviction was ok...needed more energy though. Exploding Helicopter: Haha! That would be awesome to let fans to their own impressions of Seagal when he doesn't do the dubbing. This movie had too little action for my taste. Franchise Pictures went into bankruptcy one month after its release, which might explain the hastily assembled look and feel. The extensive dubbing was apparently done because the plot was re-written after filming was completed. Great suggestion about the dubbing, Exploding Helicopter and Ty! When Seagal gets even lazier, he could also have fans doing Seagal frown impressions in the movies. Haha! Love the frown idea too. That would be great.